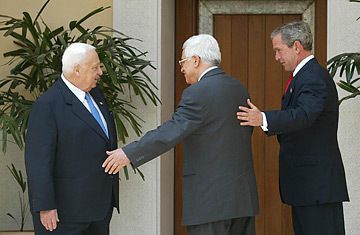 US President George W. Bush (R), Palestinian Prime Minister Mahmoud Abbas (C) and Israeli Prime Minister Ariel Sharon during the Red Sea Summit in Aqaba, Jordan, June 4, 2003. Agenda: The purpose of the summit was to boost President Bush's Roadmap for Peace, backed by the the EU, Russia and the United Nations, which aimed to end the Israeli-Palestinian conflict and create a Palestinian state by 2005. The U.S. also hoped to boost the standing of Prime Minister Mahmoud Abbas relative to his president and PLO chairman, Yasser Arafat, with whom the Bush Administration had ceased dealing. Outcome: Despite the pledges of both sides, there was little progress in implementing the Roadmap, as violence continued to rage.